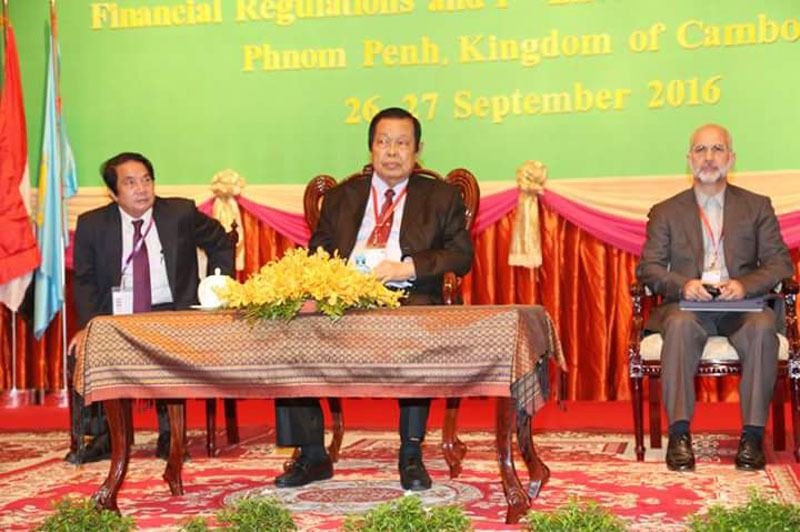 The APA First Executive Council Meeting and the Standing Committee Meeting on Staff and Financial Regulations was officially opened in the morning of 26 September 2016 at Pokeethra Phnom Penh Hotel under the high presidency of H.E. 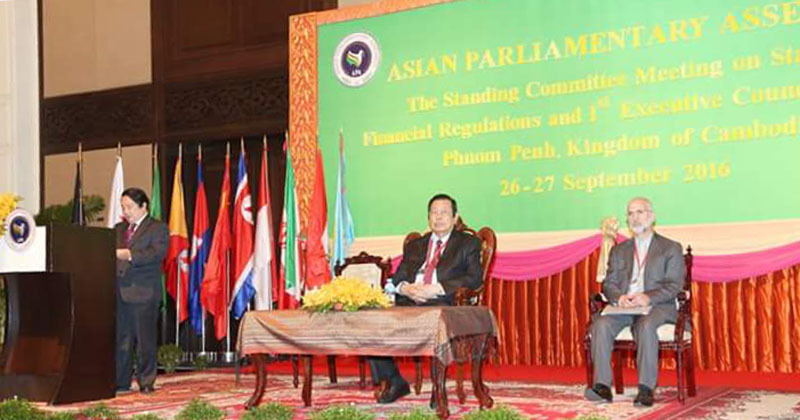 Dr. Nguon Nhel, Second Vice President of the National Assembly of the Kingdom of Cambodia and Chairman of the Organizing Committee of the 9th Plenary Session of the Asian Parliamentary Assembly in the presence of honorable delegates from 21 countries in Asia. Addressing the opening of the meetings after welcoming remark delivered by H.E. Mr. Leng Peng Long, Secretary General of the National Assembly, and H.E. Mr. Musuod Islami, APA Acting Secretary General, H.E. Dr. Nguon Nhel, Second Vice President of the National Assembly, in the name of Samdech Akka Moha Ponhea Chakrei HENG SAMRIN, President of the National Assembly and President of the APA, warmly welcomed all parliamentary delegates from Asian countries and esteemed extinguished guests for attending the very important meeting in the Kingdom of Cambodia. H.E. Dr. Second Vice President said: “the valuable time you are all expending to attend this meeting today is a reflection of your willingness and strong determination to achieve the APA vision, and your strong support for the National Assembly of the Kingdom of Cambodia, which has the honor of hosting the Standing Committee Meeting on Staff and Financial Regulations and the 1st Executive Council Meeting, which serve as a bridge to the 2nd Executive Council Meeting and the upcoming 9th APA Plenary Session in the historical and cultural province of Siem Reap. Speaking on behalf of the National Assembly of the Kingdom of Cambodia, H.E. Dr. Nguon Nhel has put some issues facing Asian region and the world on the table during the meeting. In his opening address, he said the world financial crises, the outbreak of communicable diseases, natural disasters, disputes and terrorism had major impact on some countries in Asia. He added that financial turmoil and global economic downturn had a major impact on many countries in Asia in terms of financing, cooperation and new forms of competition for global funds that reduce the scope of medium-term financing by development partners in Asia. At the same time, countries in Asia face disputes that have not been jointly settled through peaceful means and reconciliation. War and other disputes not only drag countries into crises that affect their economies and development, but also threaten security, humanity and peace—with people living in fear of armed conflicts that are contemptible and completely unjustified as far as mankind is concerned”, the Second Vice-President of the National Assembly emphasized. He also raised the issue of climate change in the meeting, saying that climate change has become a huge global challenge that prompted recent G-20 Summit in Hangzhou, the People’s Republic of China, to discuss the Paris UN Framework Convention on Climate Change (UNFCCC). Moreover, the Second Vice-President went on to say that terrorism today poses a grave threat to human security, democracy and individual rights. In some parts of the world, especially in Asia, peace is threatened by conflicts, wars and terrorism which cause so much of life and property damage. In August last year, there was a bomb attack in central Bangkok. In January, attacks took place in central Jakarta in Indonesia. A bomb explosion has since rocked the Philippines, and a café in Dhaka and the Capital of Bangladesh has also come under attack. The question facing us is whether we do more to protect ourselves and to prevent and eliminate such acts of terror in our capacity as representatives of people. The ideas raised are to draw attention to the challenges in Asian countries to help address these issues. As legislative bodies, we need to bolster bilateral and multilateral cooperation further and ensure full implementation of related agreements, memoranda of understanding and other instruments with the aim of preserving world peace, stability, progress and development, he added. As planned, the 1st Executive Council Meeting of the APA will examine and discuss 19 resolutions drafted by three Standing Committee of the Asian Parliamentary Assembly, namely the Standing Committee on Political Matter, the Standing Committee on Peace and Security, the Standing Committee on Soical and Cultural Matter, the Standing Committee on Economic Matter, the Standing Committee on Sustainable Development. In his opening remark, H.E. Mr. Leng Peng Long, Secretary General of the National Assembly of the Kingdom of Cambodia, said the 1st Executive Council Meeting follows the 8th APA Plenary Session, which was held in Phnom Penh from 9 to 11 December 2015, successfully producing the Phnom Penh Declaration, a commitment by Members of Parliament from 22 Asian countries. The Cambodian National Assembly Secretary General added that APA is one of our greatest efforts to develop our civilizations in progressive and prosperous harmony with our Asian societies. 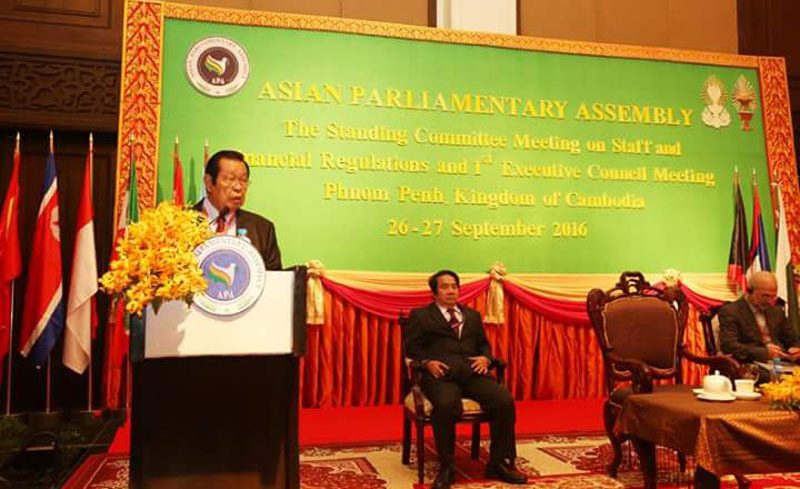 “As representatives of people, Cambodian members of parliament have actively supported all APA events by urging the enacting of legislation and the promotion of dialogue, reconciliation and a culture of peace. In the opening ceremony, APA Acting Secretary General Nusuod Islami of Iran expressed his profound thanks for all efforts made by the parliament of Cambodia in organizing these meetings, stressing that in the current context, parliaments have very critical roles to play in ensuring peace and development, especially in the reduction of poverty for Asian people. 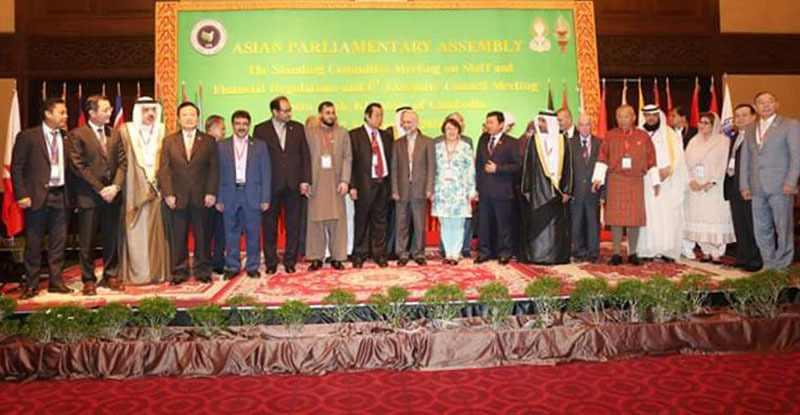 He spoke highly of members of parliament in Asia for expending time to participate in the said crucial meeting. 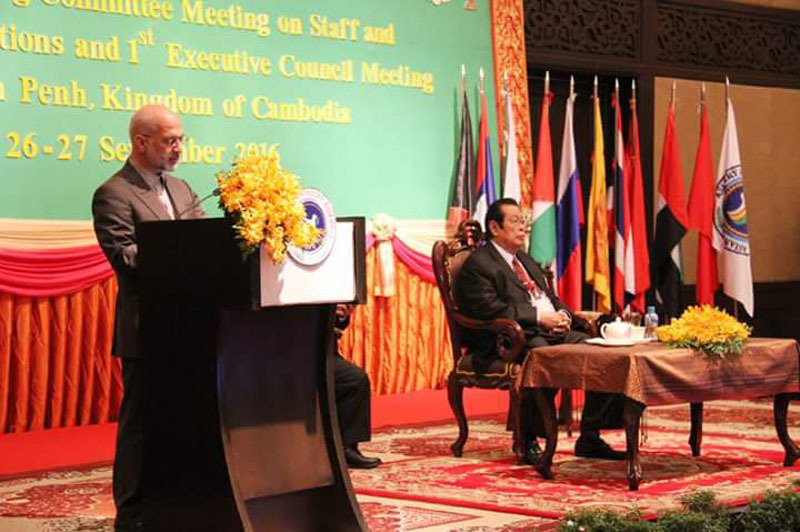 He said he firmly believe the great presence of APA member parliaments in the Kingdom of Cambodia at the present moment is a reflection of success of Asian integration that is the main objective of the APA. Also, during the opening of the meeting, H.E. Dr. Nguon Nhel urged all participants to share their recommendations, best practices, challenges and resolutions with the aim of contributing to the amendment of 19 draft resolutions on important current problems, which are considered as international instruments that put issues facing Asian countries on the table to find solutions as a basis for parliaments to strengthen legislative processes, policies and national strategic goals in full compliance with international standards. The delegates from 21 countries out of 42 APA members participating in these meetings include Afghanistan, Bahrain, Bangladesh, Bhutan, Cambodia, China, Indonesia, Iran, Iraq, Kazakhstan, Kuwait, Laos, Pakistan, Palestine, Russia, Sri Lanka, North Korea, Thailand, Turkey, United Arab Emirates and Vietnam.